Our museum standard framing includes traditional Japanese hinging, the approved method for museum grade conservation framing for works on paper. 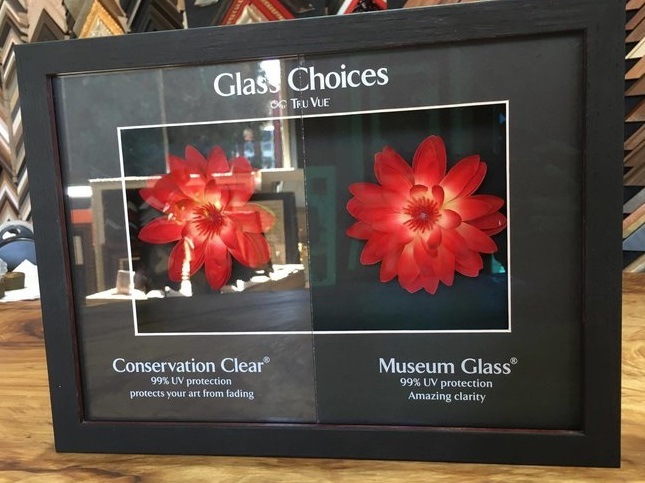 Glass quality is one of the most important factors in framing. Because Harmful UV fades artworks, our minimum quality is 99% UV filtering glass or acrylic. Conservation standard includes sealing timber to prevent the migration of acids into the canvas. We prefer to use quality metal D-Rings, screws and soft strand plastic coated wire. where an adhesive made from pure, PH stable wheat starch paste is used to adhere a Japanese mulberry paper hinge. Duplicating the process used for repairing and relining fragile or damaged paper works, Japanese hinging is 100% reversible. we use traditional water activated paper backing, to seal and protect the inside of the frame for many years. We want your piece to remain as vibrant and vivid as the day you brought it to us. Our standard quality is 99% UV filtering glass or acrylic. Where your budget allows, we are able to offer superior quality Museum Glass. Textiles, embroidery and needlework require specialist handling in order to preserve their shape and integrity. We are experts in pinning, lacing, couching and other historical and contemporary techniques for mounting and framing wool, silk, cotton and leather. We are also able to repair holes, tears and abrasions. We stretch canvases over high quality strainer frames. Available in NZ pine or western red cedar.